Hello friends! My computer has been in the shop for the last month and I'm so happy to have it back and finally able to talk with y'all. We have been soaking up all things pumpkin and Fall over here with our sweet boy. A few weeks ago we visited a local Pumpkin patch to pick out this year's pumpkin and little man had the time of his life making friends with their goats! We are building new traditions for our little family and it is already so neat to look back and see how he's grown! My boy can turn on and off those tears like a class A actor! Two seconds later, after the promise of a blueberry, you have the face below! Linking up with: Let it shine , Creative Monday , Hello Monday , A Little Bit of Everything, Mommy and Me Monday, Mommy Moments and Weekending. Oh my goodness... Your little man is SO handsome! Pouty face and the smiles - love them both! 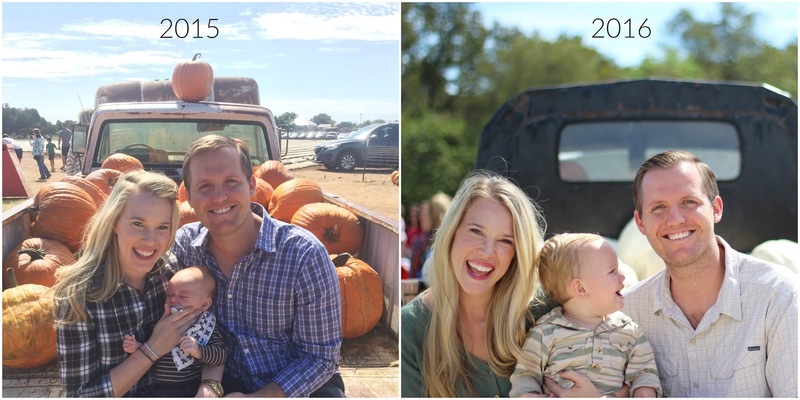 I love comparing pictures from past years with the kids. Adults hardly change but our little ones grow so quickly! I love the annual pictures. These are so cute! Glad you got your computer up and running. I love pumpkin patch pictures. So glad so many people were able to jump in the pictures.